The first of five, 85,000-ton Vista-class vessels, Zuiderdam offers many of the familiar Holland America trademarks including multi-million-dollar art collections, Explorers Lounge, Ocean Bar, an exterior covered promenade deck encircling the entire ship, large Lido pool with a retractable dome, signature "Crow's Nest" observation lounge, and, of course, the "dam" suffix on the ship's name. Guests will find the 951-foot-long ship hosts some new intriguing features including innovative "exterior elevators" on both sides of the vessel, providing guests with panoramic sea views. 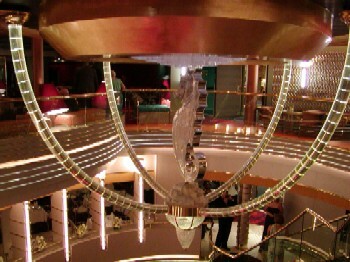 At the heart of the ship, lies the three-deck atrium, one of the prettiest at sea, with an exquisite revolving Waterford crystal seahorse suspended from the dome above. 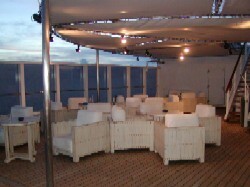 Despite the large size, Zuiderdam is surprisingly intimate and offers numerous areas that provide comfort and solitude. One of the nicest areas on the ship is a collection of comfortable wood and white-cushioned loungers outside the entrance to the Crow's Nest --a great place to read a book or take afternoon tea. Guests will have less waiting time at the Lido buffet restaurant because it separates the food into stations - Italian, bistro, deli, and continental. It is open for breakfast, lunch and dinner. However, while there is less waiting time to get food, there are difficulties finding a place to eat it. 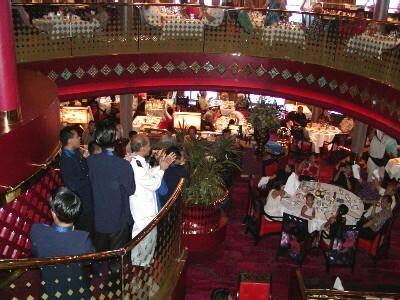 When the ship is at full capacity (as it was on my sailing), there was never enough seating at peak breakfast and lunch dining times. What's worse, during the hot summer months, the temperature in the restaurant became so uncomfortable that it made dining there a miserable experience. Because of this, my family and I only dined there twice, which was unfortunate as the food there is excellent. 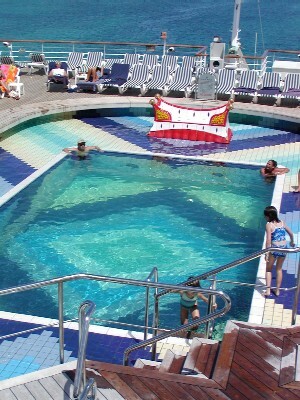 Holland America officials I spoke with noted the problem with the Lido's temperature. They attribute the high temperatures to an "airflow" problem that they are hoping to correct when the ship enters a scheduled dry dock in December. The alternative dining Odyssey restaurant, which only seats 130, is an elegant must for dinner, thanks to the touches of Italian linen and Bvlgari china. Superb cuisine and refined service is the hallmark for this venue. 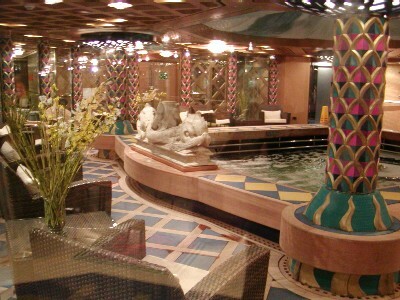 This is by far the best twenty dollars you will spend onboard the Zuiderdam. Reservations are required and if you go don't miss the opportunity to dine on the finest filet of beef at sea. The main Vista Dining Room is two stories, which despite its size, lends itself to creating separate spaces and more intimacy. 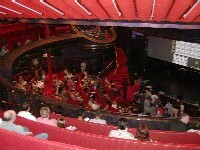 There are two small atriums in the center, and the bandstand is on the top of the center staircase columns. Open for breakfast, lunch, and dinner, the food and service rate high with passengers. With traditional early and late seating dinners, there are numerous choices of appetizers, salads and soups, five main courses and abundant dessert options. There are also low fat choices and a kid's menu that pleases even the fussiest child. Holland America has upgraded its entertainment by adding larger state-of-the-art facilities with elaborate lighting and acoustics to showcase its razzle-dazzle productions. Zuiderdam offers three new facilities: the three-tiered Vista Show Lounge, Queen's Lounge featuring "cabaret-style" entertainment and the swank Northern Lights Nightclub. 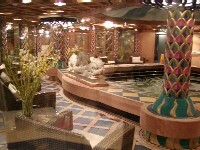 The ship also has an expanded casino and larger versions of the popular Ocean Bar, Explorer's Lounge and Crow's Nest observation lounge. 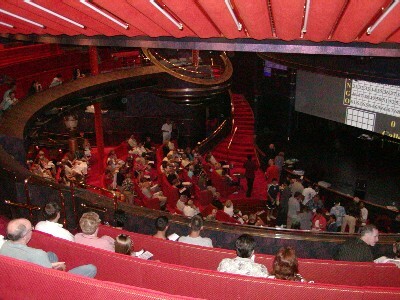 The one can't miss show onboard is the Indonesian Crew Show, an intense cultural musical experience performed by the ship's crew. 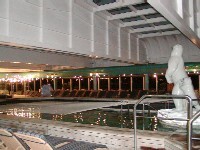 On board, a wide range of activities including tennis, basketball, swimming, and jogging are available. There's even a golf simulator where you can improve your game. Fitness aficionados will appreciate the state-of-the-art fitness center with abundant machines and fitness classes. For pampering, The Greenhouse Spa and Salon offers extensive treatments with its 11 massage and therapy rooms, hydrotherapy pool and thermal suites. With the growing popularity of families cruising with children and to capture more of that market, Holland America has doubled children's facilities on the Zuiderdam. Located aft topside away from adult activities, KidZone, with both inside and outside play areas, can be separated for kids from 5 to 12 years. 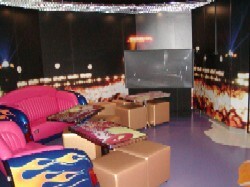 The WaveRunner teenager facility includes a dance floor, sound system, lighting effects and video game room. KidZone includes supervised daily activities, computer learning and game section, movies and special parties. Holland America maintains a ratio of 30 children to one coordinator. six-year-old needed to be in one area of the ship, and my nine-year-old in another, usually at opposite ends of the ship! Unlike other premium cruise lines, this program offers nothing unique for kids. I often found kids plopped in front of computers, video games, and movies. As one disappointed parent noted, "There's only so many videos to watch or beads to glue on paper before the kids become bored." Still, this doesn't mean Club HAL programming is lacking fleetwide. On my cruise, one couple from New York with a six-year-old raved about the program on another Holland America ship, the m/s Veendam. In fact, the child was wondering if the counselors that were onboard the Veendam were on the Zuiderdam, unfortunately, they weren't. One thing I found deeply disturbing was that there was no sign-in or sign-out for the younger children -- every other cruise line has this procedure. One Holland America official candidly admitted they do that because they do not want to assume full liability for the children. 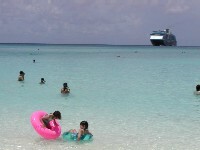 One of the highlights of the cruise is the ship's visit to Half Moon Cay -- the line's private Bahamian island. Named after Holland America Line's logo, which depicts explorer Henry Hudson's ship, the Half Moon, and also to reflect the crescent shape of the beach. This was my first Holland America cruise, and I found the ship outstanding in many areas. Embarkation was a breeze, particularly for passengers that completed their immigration forms early through Holland America's website. Disembarkation was also swift and painless. The service is the best of any big ship you'll sail on today. No matter where I went, hard-working crewmembers were always quick with a smile and assistance. 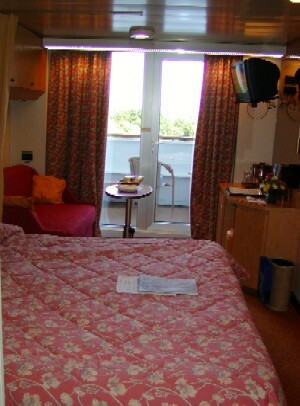 Cabins are excellent, balconies are huge and offer truly comfortable cushioned wicker chairs. Another pleasant surprise is the ship's water pressure that afforded brisk showers with consistent temperatures. Regular cruisers know what a treat that can be. 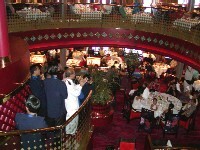 The overall quality of the food on this ship, sampled over a 7-day sailing, was excellent. Even the offerings in the Lido restaurant, were creative and appealing each night. Half Moon Cay is up there with Disney's island Castaway Cay; it is simply the best stop on the cruise. The clientele aboard my sailing was a very broad-based audience - couples, singles, families, young and old alike. There were plenty of activities to cater to most groups. While the Zuiderdam is different in many aspects from other Holland America ships, she still upholds the line's traditional high standards in service and amenities. And, that's something past and new cruisers will appreciate.